Recently, as I was installing a board slotting machine, several of us started talking about the possibility of slotting other materials. The blades that the machine uses were originally designed to cut metal, and I’ve successfully slotted wood for an artist book edition. Plexiglas, aka. Perspex, was a natural choice, given its use in mounting applications The ability to insert an flexible hinge into a piece of it seemed to be potentially useful for something, although I’m not sure exactly what. Normal plexiglas slotted fairly well, with a fairly even matt appearance in the actual slot, but cast plexiglas, which is optically slightly clearer, didn’t slot as evenly, and tended to clog in the slot itself. Reversing the direction of the blade, in order to clear the slot, exasperated the problem even more. 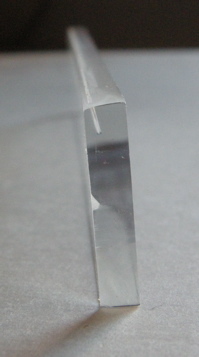 I haven’t tried the new Optium (TM) from Tru Vue, which according to the manufacturer, has less than 1% reflection at a 90 degree viewing angle, dissipates 2000 times more static charge than normal acrylic, passes a 600 dry cloth rub test (at 2.5 pounds) for abrasion resistance, 99.6% UV filtering below 380 nm and 98% light transmission. At least they send out an impressive looking sample set! Since the exact path of the blade is visible, a slotted piece of plexi is a useful teaching tool when beginning to learn board slotting. It helps the uninitiated visualize where to begin the slot relative to the height of the board. The dust tended to clump together, so a thin, rigid piece of paper was used to clear the slot. If nothing else, this visible slot is a very clear example of the precision and angle that is usually hidden.